While I’ve got most of my stamping area cleaned up and reorganized, I’m still tweaking things around the edges and figuring out how to store a few more kinds of stamping stuff. This is today’s addition to my reorganization project. In the course of reorganizing, my templates and stencils have moved several times, ending up piled up in two drawers in a wood chest of drawers in the corner. I still wasn’t really happy with this because while it gave them plenty of space, you have to paw through everything to find anything. Today, I moved them to a new home that I think will work better. 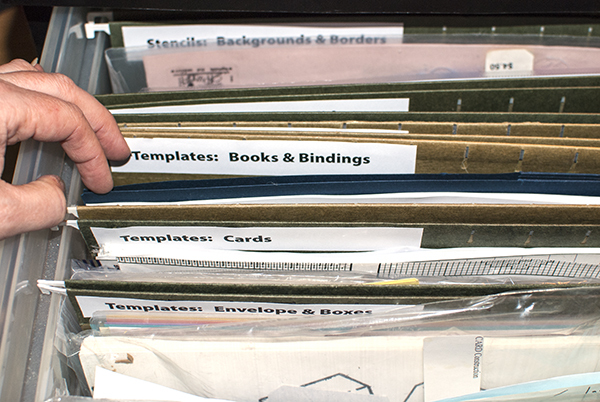 For this storage, I was inspired by Lindsay Weirich’s June 30th blog video, “Stencil Storage Solution.” She divided up her stencils into basic categories and sorted them into regular (non-hanging) file folders and lined up the folders on a shelf. This approach lets you grab a folder of stencils to take over to your work area as needed. I kept most of my stencils and templates in their original packaging because it makes even small stencils like this one easy to find in the folder. Because I look down into this file drawer, I decided not to go with regular folder tabs and printed up labels on my computer printer, applied adhesive using my Xyron machine and stuck them at the back of each folder. These larger labels are easier for me to read than the small plastic tab type system. Although it wouldn’t work well in a very full file drawer, it works in this looser arrangement of folders. I have a folder at the front where I put interesting and clever cards and boxes that arrive in junk mail that may be the inspiration for a future card or box. Then I’ve got several folders for templates (Envelopes & Boxes, Cards, Books & Bindings) and several for stencils (Alphabets & Words, Children & Holiday, Backgrounds & Borders, Things, Blank Stencil Material.) I also have another folder with a few stray mortise masks I’ve cut at various times to go with stamps. I don’t have a lot of templates and stencils and I don’t use the ones I have very often. But I’m hoping that with this easier to access storage, I’ll use what I’ve got more. How do you store your stencils and templates? 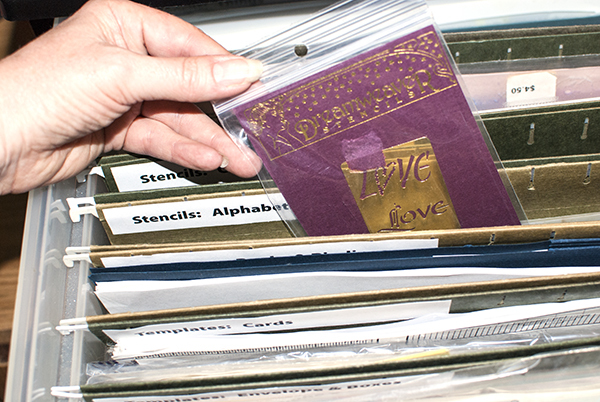 I store my metal stencils (like Dreamweaver stencils) in a 3″ deep zipper notebook with a handle for easy carrying with A-Z dividers. My stencils go in plastic photo holders (various sizes), and store behind the appropriate letter (A = animals, etc.) This works really well for me since I have soooooo many stencils. My plastic stencils…especially the ones I use with my Gelli Plate are out of the packaging with stencil name and # written with a Sharpie on the rough side…so I know which side to place down on my Gelli Plate. I also put my initial on each stencil…helps when playing with others to know what belongs to me. I am looking for a plastic box with a handle that will hold these plastic stencils so I can use another A-Z divider with them….right now they are laying flat – not as easy to sort thru…fortunately I only have 25 or so, but know I will be adding to that- LOL! hey, thanks for the plug Nancie! I am honored;) I think you will like your new system, it is great to be able to fine everything when you need it and I am using all my stencils more, even the basic shapes ones which are perfect for stippling with color for background vignettes! What size is your file drawer? I have a fair number of 12×12 inch stencils which wouldn’t fit in a regular file folder. Hi Elaine, The IRIS drawer I’m using holds regular sized file folders, so it is slightly over 12″ wide inside plus a small overhang on each side where the folder’s metal hangers rest. The whole thing measures about 15 3/4″ wide and 15 1/2″ front to back and 13 1/2″ deep on the outside. I’m using two types of file folders (just because I happened to already have them on hand from previous uses.) One type is the kind that is accordion folded on the sides so it doesn’t take up as much room at first but expands to be deeper if you fill it more. The other type is the box bottom type that has no sides but is also deeper. I actually prefer the box bottom type better because the accordion folds tend to encroach on the folder space just a little. For typical 11 1/2″ paper, that isn’t a problem but for something a little wider, it gets in the way. If I was buying (or otherwise acquiring) a file drawer for this new, I would prefer one that can hold legal size file folders to accommodate longer stencils. (I have two or three.) I have metal file cabinets in my office area that hold that size, but they hold other things. BUT, either size file folder (regular or legal size) are still only 9 1/2″ deep and so wouldn’t give you the depth you need for your 12″ x 12″ stencils. 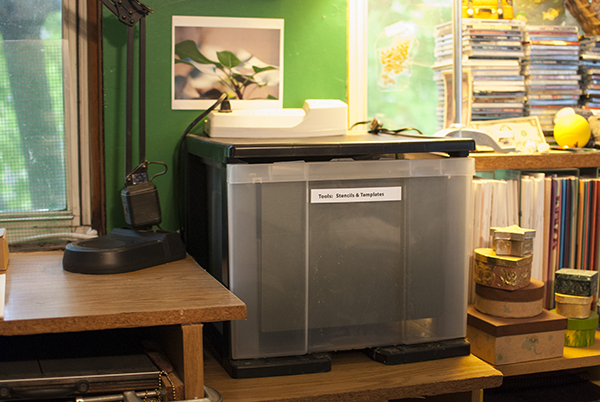 If you were using them, you would need a drawer (or maybe an open type storage box with rails to hold hanging folders) that could provide the extra 2 1/2″ head room you would need. You might want to check out Lindsay’s system. It might work better for your larger stencils.